*Please click the following URL for Entry and Application Procedures. ​People of all nationalities who are not residing in Japan and non Japanese citizen who live in Japan can apply from JTB Sports Station. Saturday, October 26th 10:00 a.m.-8:00 p.m. Note: It will not be possible to register outside of the hours listed above,. Note: You must bring proof of identity. Runners must apply in-person. 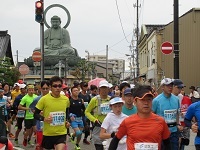 The course will be certified by the Japan Association of Athletics Federations. In the case of inclement weather Shinminato Ohashi may be unusable. In this case an alternate route will be chosen. Gate NO/Place/Distance(Approx. )/Closing (planned)/Distance from prev. Regardless of membership in JAAF, starting blocks will be determined by the time entered on your application. Commemorative T-shirts will be handed out. *If you fail to indicate your shirt size on your application then ladies will receive a small shirt and men will receive a medium. Stock in each size is limited, so please understand if we are unable to provide your size. It is not possible to change shirt size after the application has been submitted. 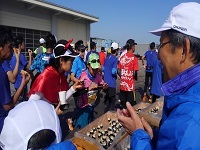 ※Only runners who completed the race within 7 hours. In addition, competitors should be able to complete course within 7 hours. -Please train properly for the event, receive a physical, and only compete if you are healthy enough to do so. -The sponsors are not responsible for lateness due to public transport or road conditions. -Costumes that make others uncomfortable are forbidden. -Do not wear or attach to your body anything for the purpose of advertising, including company names, product names, designs or trademarks. -There are cases where the organizers will allow the consignment sale of photographs. -Runners need Registered JAAF name and number if runners apply JAAF Registered course. -In addition to the above, please follow the directions of the organizers in all matters. -The following services are available to competitors: participation guidance, record notification, and notification of relevant information. Announcement of rankings is provided by the sponsors, co-sponsors, and related organizations. *There are cases where you may be contacted by the sponsors or the entry center regarding the content of your application. -Multiple entries by the same person will be rendered invalid. Please be careful. -It will not be possible to cancel or reschedule for personal reasons after application. -The event organizers take no responsibility for any late applications and payment caused by Internet connectivity/device malfunctions etc. -Please note that some applications made over the Internet may not be successful due to the applicant's device, operating system, or Internet browser. 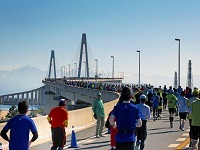 -The Toyama Marathon 2019 asks for help that runners and supporters come to venue by public transportations avoid traffic jams the event day. 1.If the race is cancelled due to weather or a natural disaster, we will be unable to offer a refund. 2.Receipts will not be issued for the entry fee or the handling fee. 3.The organizers will not be held responsible for any illness or injury that occurs during the event. Emergency treatment will be available. 4.Compensation for accidents, injuries or sickness that occurs during the marathon is covered by the marathon’s insurance. 5.It will not be possible to cancel or reschedule for personal reasons after application. 6.You must not falsify age or gender information on your application, and only the applicant may participate in the event. 7.In cases of excess or duplicate payments, no refund will be offered. 8.The right to release all videos, photos, articles, names, ages, genders, addresses (nationalities, municipality) in television, newspapers, magazines, and the internet shall remain with the organizers. 9.This competition shall comply with all domestic laws. 10.The application process and race will be held according to the terms set forth by the organizers. 11.Entrants who is under 20 years old must obtain the permission of their parents or guardians before applying.